Were the Molly Maguires victims or villains? You decide, as you visit the sites where the organized labor movement began and relive the events that lead to the death of over a dozen men in Schuylkill County’s Coal Country. The Molly Maguire Auto Tour is a project of the Delaware and Lehigh National Heritage Corridor and the Schuylkill River Valley National Heritage Area. The tour consists of four cassette tapes or CDs and an accompanying 24-page booklet that direct the listener to 24 sites in Carbon and Schuylkill counties related to the Molly Maguires. It can take three to eight hours, depending on the number and length of stops. 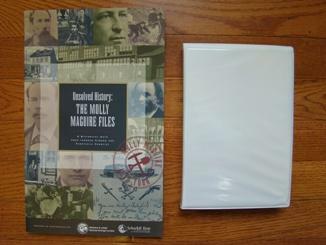 The accompanying booklet features rare historic photos of the Mollies and their environment, and a fold-out detailed map of Lansford, Summit Hill, Shenandoah and Tamaqua. The tour is a round-trip loop that can begin either from the Jim Thorpe Train Station in Jim Thorpe, PA, or the Schuylkill County Visitors Bureau in Pottsville. It takes listeners on a journey of discovery while telling the intriguing and controversial story of the Molly Maguires. The Molly Maguire’s were a group of Irish immigrant miners accused of using violence in retaliation for dangerous and repressive conditions in the anthracite coal mines and patch towns. In the 1870s, Frank Gowen, President of the Philadelphia and Reading Railroad hired a detective to infiltrate the Molly Maguires. Gowen, who served as district attorney of Schuylkill County, convicted the Molly Maguires based on what many believe to be the false testimony of the detective he hired. In 1877, 20 members of the Molly Maguires were hung. Today, historians still do not agree on whether they were guilty or innocent. Were they victims or villians? Take the tour and decide for yourself.